(Ed. Note: When I first posted this in 2009, I had no idea how popular it would become. For 2011, I’ve updated the content to reflect updates and new options in the market.) (Ed. Note 2: Thanks to Techradar for naming our Yule Log Visualization for Windows Media Player one of the Top 60 free apps for Windows at #4) (Ed. Note 3: In 2011, I replaced the FM Transmitter with the CZH-05B from Amazon.com. This is highly recommended over the C.Crane and is worth every penny. A window. Just about any window will do. The Complete Virtual Santa Kit or an old Projector and PC. HD isn’t needed. An old DVD player with ability to set playback to repeat. A white sheet to cover the window. Avoid patterns. Step 1: Set up the Virtual Santa Kit (or Projector) The Virtual Santa Kit includes everything you need for projection. 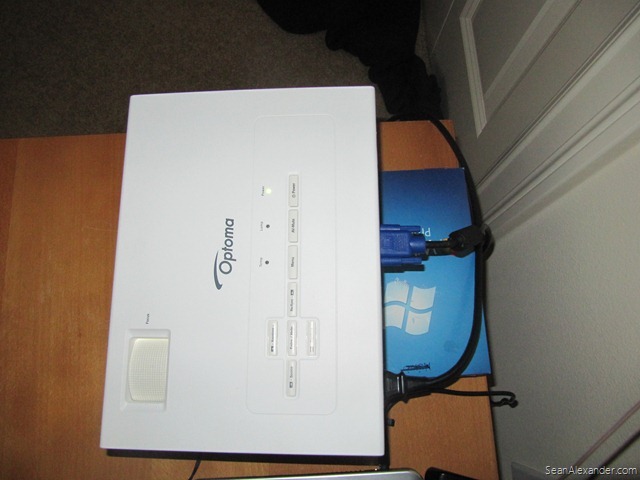 If you’re going the homegrown route, I’m using an Optoma DS317 SVGA DLP Projector . It has a great throw ratio and at 2500 lumens should be bright enough for neighborhood outdoor movies during the summer. Don’t worry about fancy features- a standard-def projector will work with VGA input. The trick is to get one with 2000 lumens or better. Also look for ability to adjust keystone and reverse the image. 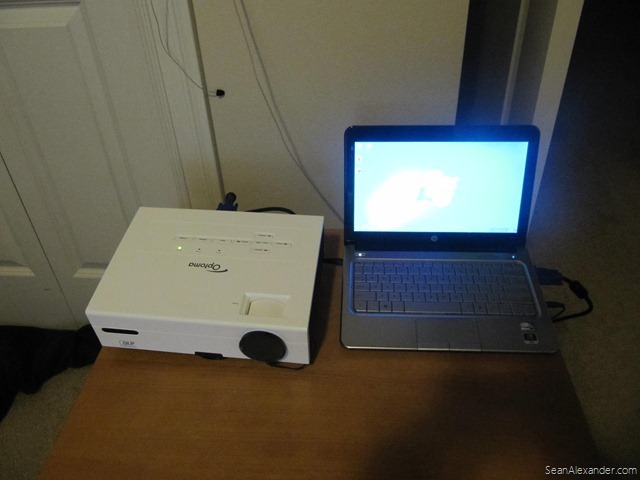 I placed the setup on a small coffee table and made good use of the Windows 7 box to adjust the angle and do a quick alignment with the window: Step 2: Prep the PC (or DVD Player) As you can see above, I decided to use a PC instead of a DVD player. In this case, Windows 7 and Windows Media Player make an excellent choice if you’re going to change up your order, add custom music etc. I set up the projector via the included VGA cable and have extended Windows Media Player to run on the projector as a second display. 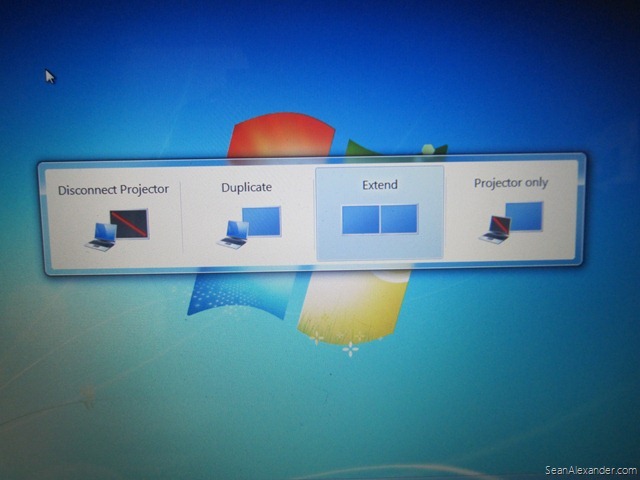 You can set this by pressing [Windows Key] + P and choosing, “Extend” as seen below: Make sure Windows Media Player is set to run in full screen and move the mouse cursor back over to the main Windows display. This will set the player controls to hide automatically and has the added benefit of making sure any alerts/notifications will not appear on the projector. The last thing you want to do is ruin the illusion. Step 3: Prep the FM Tuner There are a number of FM tuning options available, however I strongly recommend against using a solution designed for in-car. They’re just not powerful enough. 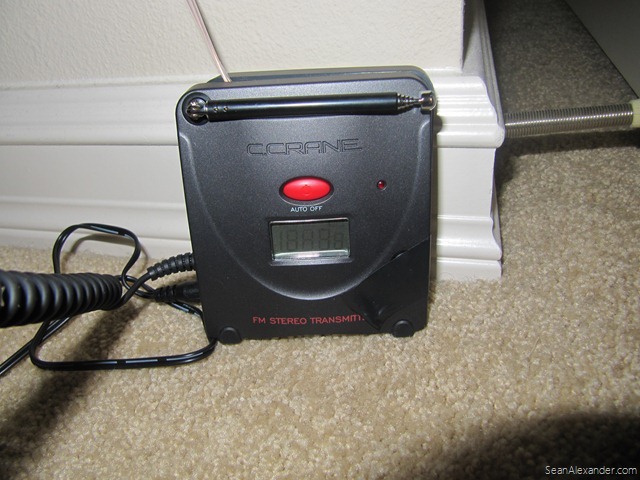 Be sure to read the comments on Amazon for the C. Crane Digital FM Transmitter and you should get tips on how to boostfor cars driving up to be able to hear your music. If you’re eagle eyed, you’ll notice below that I’ve soldered a dipole FM antenna wire to the transmitter to improve the distance. To figure out which station works best in your area, I recommend Belkin’s “My Best FM Stations” service. Just tap in your City/Zip/State and it will give you a number of options. Be sure to try these out yourself. Step 4: Create a Custom Movie with your custom Virtual Santa Santa’s Symphonies is available as a digital download (MPEG-4) which plays fine with Windows 7 and Windows Media Player. For Santa in the Window, there’s no music provided, but it’s easy to add your own – just use Handbrake to rip the DVD, add your favorite holiday music tracks with Windows Live Movie Maker or iMovie and save. You”ll also notice that I have shuffle and repeat turned on on WMP. Be sure to set repeat so the video can play indefinitely. With Windows 7, the system is so stable I’ve let it run for an entire week without issue. If you’re going the DVD route, burn a DVD with “loop” turned on via DVD Burner or iDVD. 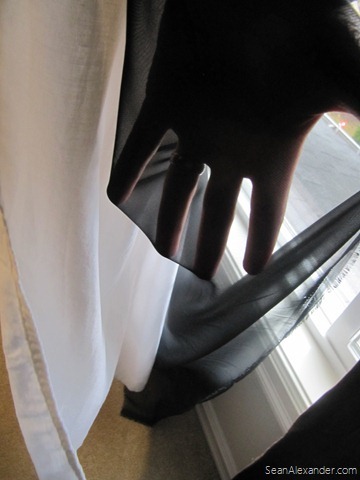 Step 5: Set up the Window “Screen” For the projection screen, I used a two-ply of a white sheet and the black scrim material as seen below. The scrim adds a great deal of realism to the effect because it blocks out the high intensity “halo” effect many projectors create and increases the black levels in the video. I just pinned up the scrim and the sheet behind it. Take this picture to your local fabric store and they’ll be able to set you up (thank to my wife for contributing to the effort <g>). Step 6: Fire up the projector, Create a Sign for the Yard and and delight the Kids Be sure to level and center the display. You’ll also want to adjust the distance from the window so the scale of Santa is correct. I use the WMP toolbar in full screen (seen below) to help center the video, then it automatically hides: Remember to move the mouse cursor back to the main screen Be sure to put a sign on the yard with the FM Frequency you’re transmitting on and house and you’re ready to go! Looking for more project ideas? Click the “Project” link at the top of the page. Happy Holidays everyone! Can you post a link where I can get santa videos. The symphony ones I found he’s jist waving a wand. I want to make him like with gifts or waving etc. Thanks.